Horgath is a small boy with a big heart. Overhearing stories from old fishermen about a metal man and putting this with a trail of destruction in to the woods, Horgath discovers and befriends an Iron Giant. With the help of Dean, the local scrap metal merchant, he protects the Giant from FBI and army interests as both learn the value of friendship. I’ve wanted to watch this film for years (mainly due to it being the directorial debut of Brad Bird) and I wasn’t disappointed. The Iron Giant is animated but it’s not a film solely for kids. Unlike Disney classics, there is on-screen death (in a nod to Bambi, we actually witness the death of his “mother”) and adult problems (a single mother trying to look after her inquisitive son) with an underlying feeling of dread that things may not turn out for the best. 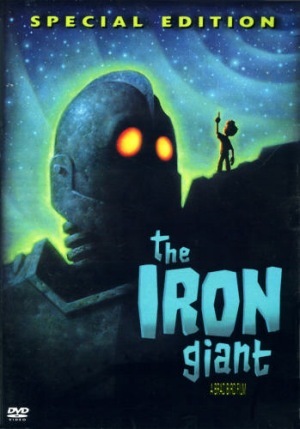 I really enjoyed The Iron Giant – it’s fun, it has a big heart and the animation is superb – I watched it on DVD, when it is released on blu-ray I would imagine it will look fantastic. It’s a quaint tale of boy meeting robot, becoming best friends and trying to save the day. This was also a film that i had never seen. Did enjoy it. Probably the easiest film job Vin Diesel is ever going to have!